One of the most important missions of our sanctuary is to promote adoptions of mustangs out of BLM holding pens. To show people how to go through that process and prepare them for their own mustang we decided to adopt this young mare and foal to film it for a video diary so that people can see exactly how the whole thing works from filling out the paper work to picking the horse up and bringing it home. 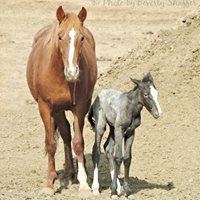 We found this photograph of a mare who had just given birth to her foal in a BLM corral in Burns Oregon and decided to adopt her to get her sickly baby safe and for her to highlight the process of adoptions and promote them. Swift is now an amazing looking young filly in her own right and lives out with Bear’s herd. She, like all the young horses born or adopted young at Skydog, is gentled early so that we can handle them for feet, loading and shots. It truly is the best of both worlds for these horses.